This is the first of what we hope to be many blogs about what we love to do…farming. We would like to share some of our knowledge and also share some of our great recipes over the course of this season. To give some validity to our future posts, we thought we would first tell you about us and how we grew Parlee Farms. The story of Parlee Farms began when Mark and I (Ellen) met while working as engineers in Boston. After we were married in 1982, Mark continued to spend his Saturdays just as he had done since he was 12 years old – working at his uncle’s farm in Chelmsford. Mark always thought that being a farmer would be the perfect profession. In 1986, we purchased 10 acres of beautiful river-bottom land on Farwell Road in Tyngsboro just outside of Boston, MA and the dream of Parlee Farms was becoming a reality. From 1987 through 1993, we rented land on Westford Road in Tyngsboro from the Academy of Notre Dame while developing the Farwell Road property. We opened the field to the public in June 1988 with two acres of strawberries, a scale set on a plank, and a blue tarp over our heads to keep the rain off the fresh picked strawberries and the scale. We also farmed about 5 acres of strawberries in Chelmsford and would alternate picking days with Mark’s uncle who continued to run the home farm. 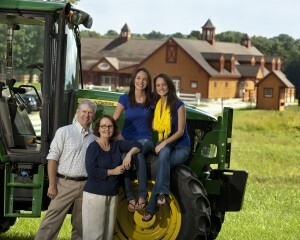 Since we were operating from two locations, we named our business Parlee Farms. During this time, we became the parents of two wonderful daughters, Mary and Annie. With strawberry picking season lasting only 4 weeks, we continued to work in engineering to supplement our income. In 1991, we were able to purchase 42 acres of land adjacent to our 10 acres on Farwell Road. At that point, we were certain we would have enough land to build a successful farm. The Farwell Road location opened to the public in June 1994. As our daughters grew, we worked hard as a family to make our dream of farming a reality. Mark left engineering in 1992 to farm full-time, while I continued to work in engineering until 2004. Mary and Annie both began working on the farm when they were seven years old and have been very instrumental in the success of the family business. Over the years, we were fortunate to be able to purchase more land on Farwell Road. Almost 70% of our 93 acre farm is preserved under Massachusetts’ Agricultural Preservation Restriction Program, which means the land will always be used for farming and cannot be developed. 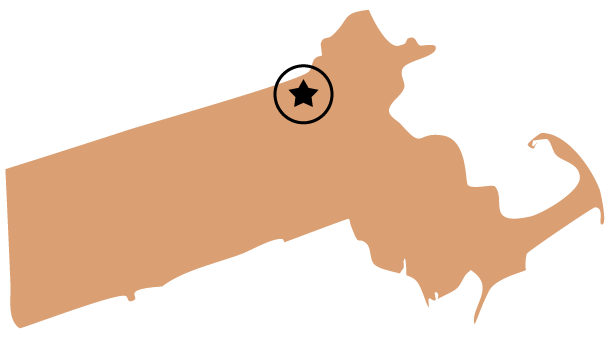 As our Tyngsboro farm grew, we gradually pulled out of Chelmsford and by 2001, we were operating only in Tyngsboro. As we added land, we added more crops – blueberries, apples, peaches, nectarines, sweet cherries, pumpkins, and sweet corn. To sell the crops, we added the farmstand, Annie’s Animal Barns, Mary’s Country Kitchen and Bakery, 14 hay ride wagons, an Indoor Restroom Facility, and many wonderful employees to keep everything running smoothly. Of course, this would not have been possible without the fabulous customers that return every season. We are so thankful to all who allow us to do what we love to do!